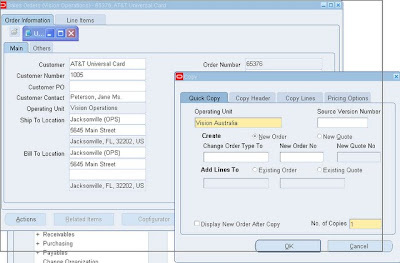 One of reader has question about "How to Copy the Sales Order across the OPerating Units". Attach is the Screen shot and it clearly explains how to do that . 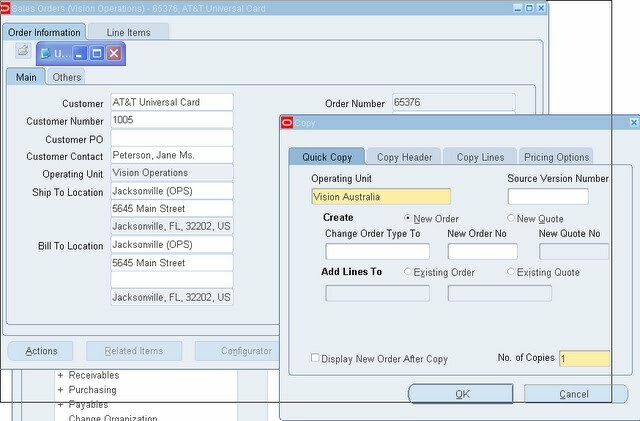 As ahown in the screen shot , I copied the Order # 65376 from Operating Unit "Vision Operations" to Operating Unit "Vision Australia". shuold exists in the destination Operating unit. Thanks for your reply. Another thing, after copying the Order if i want to change the bill to/Ship to address/price list/Order Type/Item Price of the coppied Order in another operating Unit Can I able to do that? Yes you can make changes , unless you are not violating any Processing Constraints (PC).